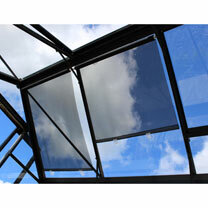 Provide shade in your greenhouse with these handy Roller Blind Greenhouse Shading Kits. The blinds can be positioned anywhere in the greenhouse thanks to the suction cups that will stick directly to the glass, so you can provide shade exactly where it’s needed. Easy to assemble, the blinds can be fitted in minutes and deployed or stowed away in seconds. Shading blind measures 575mm wide and rolls out to a total length of 1900mm. Total width including fittings is 610mm. NOTE: Roller blind has manufacture logo on outward facing side.